Frank Leverett (1859–1943) and Frank Taylor (1860–1938). The Pleistocene of Indiana and Michigan and the history of the Great Lakes. Washington, D.C.: U.S. Government Printing Office, 1915. U.S. Geological Survey, Monograph, number 53. 529 pp., 32 plates, maps, and figures (some in color and folded in rear pocket). Fitbit needs a Frank Leverett model to add to its collection of “fitness trackers”. Why? Leverett did field work the old fashioned way: he walked and walked and walked across much of the rural Midwest at the end of the nineteenth century and start of the twentieth. According to one biographer, in the course of analyzing glacial features over decades detailed in some 300 personal notebooks, Frank Leverett walked the equivalent of four times around the planet, or 99,604 miles! Frank Leverett and Frank Taylor worked for the U.S. Geological Survey, under the direction of Thomas Chrowder Chamberlin (1843–1928), in order to understand the glacial geology of the United States, bringing intellectual order out of sedimentary chaos. 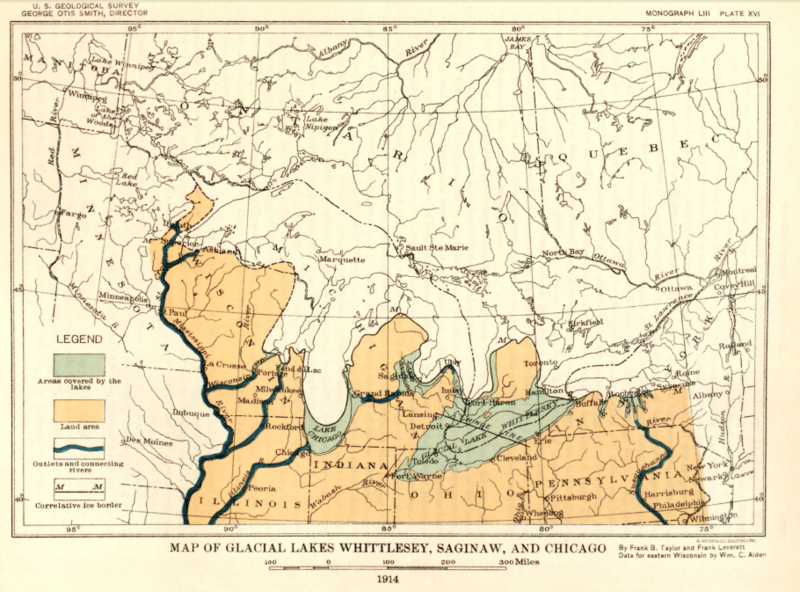 Leverett created two magnificent monographs for the U.S. Geological Survey on the geology of the Midwest and the Great Lakes — The Illinois glacial lobe, published in 1899, and Glacial formations and drainage features of the Erie and Ohio Basins, which appeared in 1902. 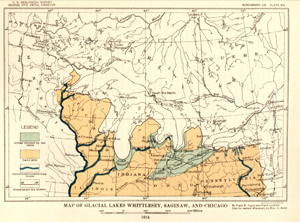 With Taylor, they devised the most significant monograph in the series, entitled The Pleistocene of Indiana and Michigan and the history of the Great Lakes, released in 1915. It was The Pleistocene of Indiana and Michigan and the history of the Great Lakes that revealed glacial geology around me in Illinois, Indiana, Michigan, and Wisconsin. Literally, scales fell from my eyes. I was able to envision mile-high sheets of ice depositing evidence in the form of erratics, eskers, kettles, loess, moraines, and till (click on the map to the left to see a larger version). The result of years of field work by Leverett and Taylor was an accessible standard, providing enormous insight into the landscapes of the Great Lakes states. Reading this monograph means that you will never regard the center of North America as topographically challenged. When I frequently cross the Valparaiso Moraine to the east or south, I am grateful to Frank Leverett and Frank Taylor for helping me understand this distinct geological feature, along with many others, all in my neighborhood.